In the following scenario, we have a NetApp ONTAP 8.3.2 HA-Pair, with one DS2246 shelf half populated with 12 SSDs, and 4 pre-existing SATA data aggregates (2 per node). We will create a storage pool using 11 disks (leaving one SSD spare across the HA-Pair*), and use this one storage pool to hybrid-enable the 4 data aggregates. Note: Most of this information can be got from the Physical Storage Management Guide. 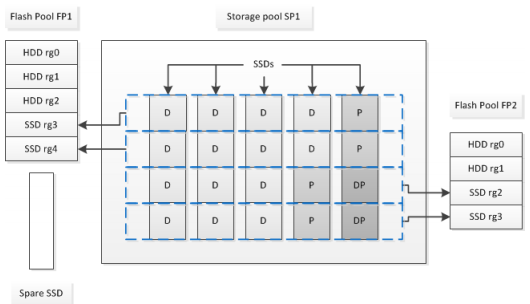 ** Storage from an SSD storage pool is divided into 4 allocation units - hence one storage pool can be shared by up to 4 aggregates. In a HA-pair, initially each node has 2 allocation units - these allocation units can be reassigned. i) Remember, once you’ve added a storage pool allocation unit (or 2/3/4) to an aggregate, you can’t delete the storage pool without first deleting the data aggregate. ii) It is easy to add an SSD disk to a storage pool (storage pool add), but you cannot remove SSDs from the storage pool without deleting it. 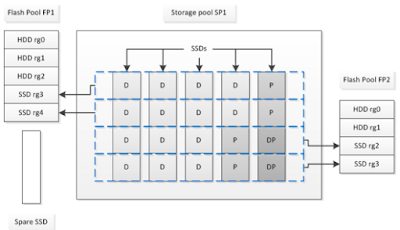 iii) SSDs in a storage pool are partitioned into 4 partitions per disk, hence the 4 allocation units. This also allows the storage pool to be shared by RAID-4 and RAID-DP HDD aggregates as in the diagram below.